It is time for another challenge over at 613 Avenue Create - and this week the optional twist to our Anything Goes Challenge is to include the Moon and Stars in your creation. 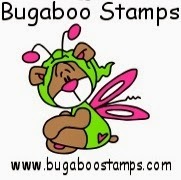 I'm working with one of our generous sponsors - Bugaboo Stamps today. The image I have colored is called "Fairy Kid Sitter"
My card is super simple. I colored my image and cut her out. I cut a circle shape into some gold pearlized paper, then cut a smaller circle shape our of one side of that to create the moon. I added some shadows and details with my Copics. I used a small star punch from Studio G to cut some gold stars. I layered all of this on my background paper, which was inked with Prima chalk ink in Farmer Jeans. For my sentiment, I broke out my Heidi Swapp Foil. This was one of my first times using it, so it was an adventure. I printed "love you to the moon and back" on my computer and foiled it, before cutting it into a small double fishtail banner, and inking it with the same Prima ink. Please come join us at 613 Avenue Create this week, and be sure to check our the other gorgeous creations by my teammates. Awesome card and darling image.. a favorite of bugaboo. Love the scene you created. Thanks for joining us at Inspiration Destination. Beautiful card! great coloring! Thanks for joining us at Sister Act Card Challenge. Hope to see you again on the next challenge! Gorgeous.....a lovely image & fab colouring! Thanks for joining us over at Lil Patch of Crafty Friends this month & good luck! such a lovely card! The coloring is wonderful!